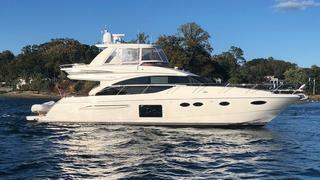 NITTANY LION" is a remarkable example of Princess Yacht's highly successful 60 Flybridge series. Properly equipped by her knowledgeable owner and maintained to a tee, this boat is a must see. Her interior is finished in custom Gloss Walnut which complements the understated yet sophisticated styling approach Princes Yachts is famous for. The layout can easily adapt to the specific needs of the future owner. Three staterooms and one crew cabin can accommodate you, your crew and up to 6 guests in comfort. Each stateroom is equipped with a flat screen display and media player. The upper and lower control stations are equipped with the latest in navigation and communication technology for extended cruising. Mechanically fitted with CAT C18 1015 HP series motors, Onan generator and SeaKeeper Gyro Stabilization, NITTANY LION will provide you and your guest with the utmost cruising experience.